I have no idea how ramps became such a fanatically-trendy allium. For my money and tastebuds, I’ll take garlic scapes any day. You should, too. 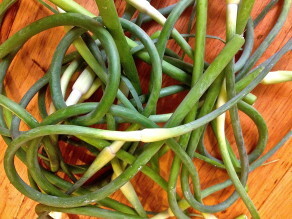 Scapes will last in your fridge forever-ish, they’re heartier and less costly than those precious wild onions (not that it’s a contest) and a few scapes go a long way. 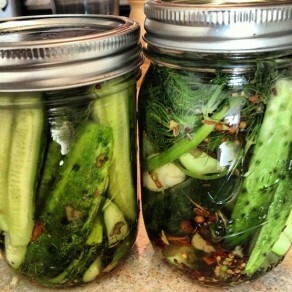 Plus, there’s an awful lot of easy and delicious things you can do with them. These elegant-looking, curly garlic bulb tops have a fresh, herbaceous quality that’s lighter and less earthy than the bulbs, which makes scapes a fine add on to any variety of dishes or pan sauces or soups, imparting them with a bit of texture and zippy garlic flavor. My first piece of advice about using scapes: Get creative. I can’t imagine they’d hurt any savory dish you’d try them in. Some inspiration certainly can’t hurt though. Sauté 3 finely-chopped garlic scapes in some butter or olive oil for about a minute, add 1/2 chopped tomato (or don’t), a pinch of paprika (or not), then add 2-3 eggs–depending on your appetite–salt & pepper to taste. Scramble soft then mix in some crumbled ricotta salata or feta or goat cheese…your choice. Sauté 4 chopped garlic scapes with the other 1/2 of the tomato from yesterday’s scrambled eggs. 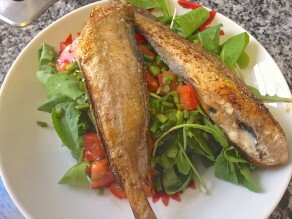 Cook a minute or so, then place over a bed of Ray’s baby arugula, adding salt and pepper to taste, a shpritz of lemon juice and a drizzle of good olive oil. The fried fish tops off the dish. To make the fish: I used Ling Tail from Gabe the Fish Babe, a meaty, ocean-water fish that tastes like a cross between cod and fresh sardines, sold at the Park Slope Food Coop. Any white fish would do, as would fresh sardines. Dip fish in paprika and black pepper-seasoned flour, shake off the excess flour then pan fry til brown, about two minutes per side. Finish with salt. The next thing I plan to make is this Garlic Scape with Almond Pesto from Dorie Greenspan (who also recommends adding the raw scapes to tuna or chicken–or, I would add, salmon or egg or, come to think of it, potato–salads). The possibilities are endless but, alas, the season is not, so visit your nearest Bradley Farm stand this week and fill up a bag. You’ll thank me.